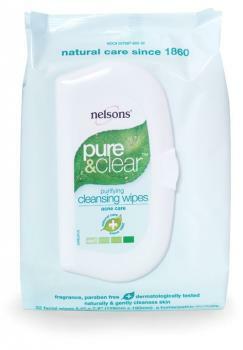 Cleanse Perfect for use on-the-go, Nelsons Pure & Clear Purifying Cleansing Wipes soothe redness to restore skin, leaving it refreshed and cleansed. Easy to use, Nelsons Pure & Clear Purifying Cleansing Wipes are great to keep on-hand whether you are heading out after work, packing for a weekend away or need a cleanser to pop into your gym bag. The healing combination of the four main ingredients acts to heal troublesome skin. The added benefit of Witch Hazel Leaf Extract acts as an anti-inflammatory to calm red, irritated skin. How to use: Wipe over face using upwards and outwards circular movements, avoiding the eye area. Inactive Ingredients Water, Glycerine (palm source), Coconut Oil, Sweet Almond Oil, Avocado Oil, Cetearyl Wheat Straw Glycosides, Cetearyl Alcohol (palm source), Phenoxyethoanol, Tea Tree Leaf Oil, Sodium Benzoate, Potassium Sorbate, Cirtic Acid, Tocopherol (vitamin e source), Witch Hazel Leaf Extract, Alcohol, Benzoic Acid, Dehydroacetic Acid, Limonene (essential oil source), Linalool (essential oil source).